Christmas is just a few weeks away! It’s time to take the dusty boxes full of sparkling garlands, lights and tree ornaments out of the closet and onto your walls and shelves. We’ve got some ideas to help you decorate on a budget and without damaging your rented property. Decorating a rented property is quite the hassle. You can’t do any permanent changes without your landlord’s approval. And landlords rarely approve decorative work, because the next tenant may not like it and that’s a problem they want to avoid. So, when we consider decorating rented properties, it’s important that the decoration is 100% removable without any permanent marks. That means no nails, screws, paint, etc. or at least minimizing the use of such. When you’re working under such constraints, it can be challenging to come up with fun ideas for Christmas décor that is budget-friendly, attractive, and festive at the same time. 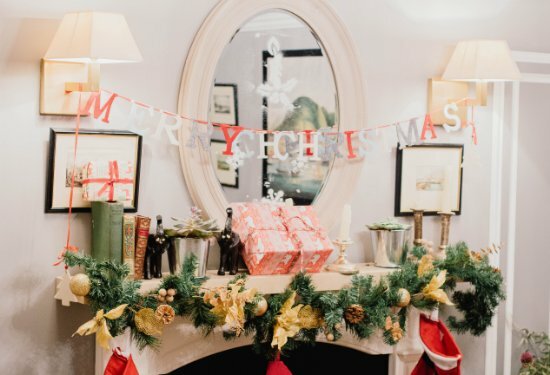 So, in this article, we’ll share some easy to implement ideas and hopefully inspire some Christmas spirit in you and your home. Let’s take a look! These days, and thanks to Chinese manufacturing, cheap decorative items go for pennies in the local shop. It’s easy to buy a handful of them under 10 pounds. However, most of them last shortly and are not particularly impressive. Instead, you can create your own decorations for Christmas using what you already have available. No doubt, you already own several boxes of tree ornaments and lights. If you combine them with everyday items in your home, you can create beautiful arrangements that are unique, festive and free. 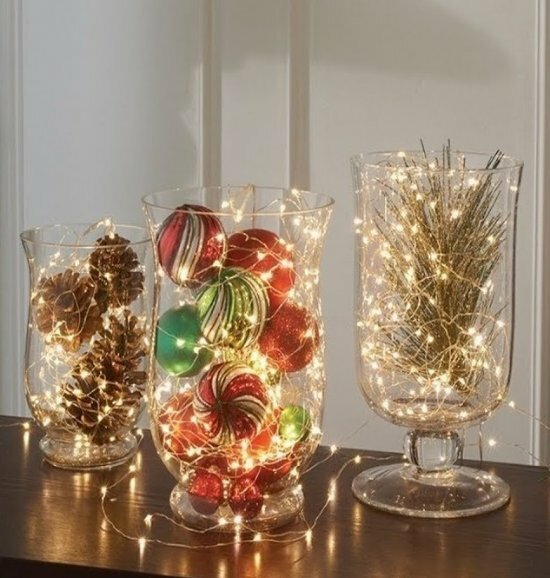 Here’s an idea: you can take a cluster of large glass vases, and fill them up with leftover tree decorations. Feels dull? Well, you can spruce the whole thing up by artfully wrapping them up with strings of fairy lights. No vase? A large jar would work just as well, if not better. 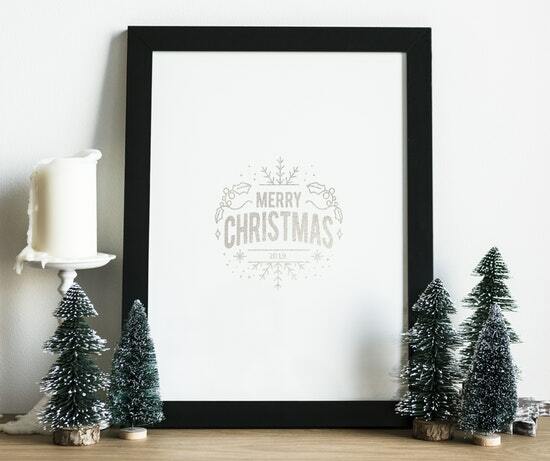 Do you have a lot of Christmas themed décor lying about? Or have some leftover ornaments from the tree? Here is a simplified version of the idea above. You can arrange decorative clusters of leftover decorations on free tabletops and shelf surfaces. It can comprise of picture frames, miniature Christmas trees, tealights, candelabras, snow globes, and other such things. Always have a centerpiece in the composition and try to select smaller items that complement it by shape, style, and color. Position just a few of these clusters in key places of your home, like on the opposite wall of your front door, so guests who come to visit will immediately focus on them first. You can replace your regular décor with such items to emphasize the seasonal décor and enhance the Christmas feel of your home without going overboard. More often than not, less is more. Cluster arrangements look the best when they’re set up against a plain wall. The dining table is one of the most important Christmas attractions – it’s where you gather with family and loved ones to share some quality time and a good meal. 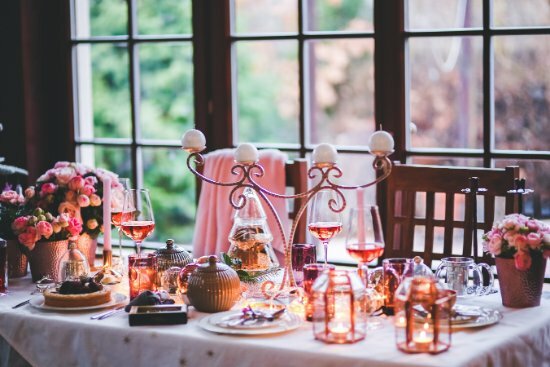 Chances are, your guests will be looking at the table more than anything else. So, it’s the perfect way to add some seasonal décor. You can put large, Christmas themed, centerpieces in the middle of the table and complement them with additional items like leftover tree accessories, candles, lamplights, candy canes, and even flowers! If you have Christmas themed dining set, then you can cut back some of the extra accessories. You don’t want to oversaturate the table and make it difficult to reach around without toppling something over. Your family and friends will appreciate the effort, especially if it’s accompanied by a well-cooked dinner. It’s the perfect opportunity to flex your decorative muscles while respecting the integrity of your surroundings! 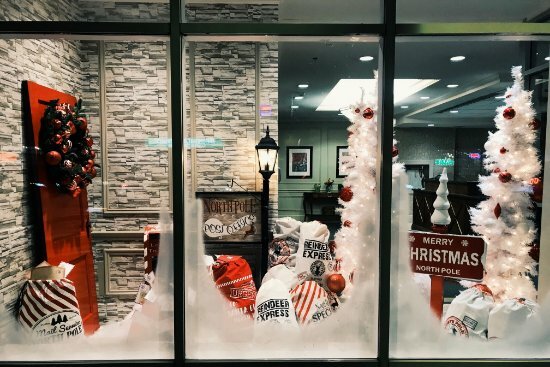 If Christmas could be defined by a color palette, then it would be red and white. From Santa’s ensemble to sweet candy canes and stockings, these two colors are rampant in the festive spirit of Christmas! So, with some thinking outside the box, you can very efficiently recycle some of your other belonging for Christmas. As long as it’s white or red, and you add a couple of smaller accessories to it, practically anything can go for a Christmas decoration. Combine your temporary decoration with empty gift boxes, Santa hats, paper wreaths, and other Christmas specific items to blend them in. Since hammering nails or driving screws into the walls is almost always forbidden in a rented property, you’ll need to get creative in order to hand anything up for Christmas or any other occasion. Double-sided tape, velcro strips, and sticky putty are all good ways to hang a picture on the wall. They are easily removable and leave no permanent traces on the surfaces. However, if you have a more complex shape that you can’t really stick to something easily, a good cheat is to bring in a large board – chipboard, plywood or MDF scrap pieces are readily available in your local hardware store and sell for pennies, literally. When you find a decent sized board, simply lean it against the wall, and hang your wreaths, stockings, and banners onto them, instead of directly using the wall itself. If you have time, or if you’re up for some DIY, you can simply paint these planks red and white to match the Christmas palette. While it’s not a traditional style of Christmas decor, the red door in the picture above appeals very much to contemporary tastes. You can nail and screw on it with a clean conscience. When Christmas is gone, you can simply take it out or repaint it to match your usual pallette. If you do decide to spend on Christmas accessories, spend a couple more minutes to find the right deals and discounts. Laura Ashley might be a home décor big name, but that doesn’t mean they do not have some amazing deals. With their vast collection of Christmas accessories, you can decorate your apartment for Christmas without breaking the bank if you use the right promo code. A cluster of these Stag Tealight Holders on your fireplace mantle or even the coffee table can bring in the spirit of the season perfectly! Christmas décor is all about creating the right ambiance, but since you cannot alter the property in any way, it can be challenging to get the right atmosphere. But you know what always works best? Beautiful lights! You can dim or switch off your lights and arrange an array of decorative fixtures all throughout your space. These lights can vary in shapes, sizes, and forms. Just put them anywhere – haphazard, asymmetric. As long as you balance the light intensity in the room (not clumping everything in the same corner), almost everything works. Having your lights as centerpieces means everything else will fade-in with the background. This means that you can reduce the amount of stuff you need to keep a Christmas theme around your home. 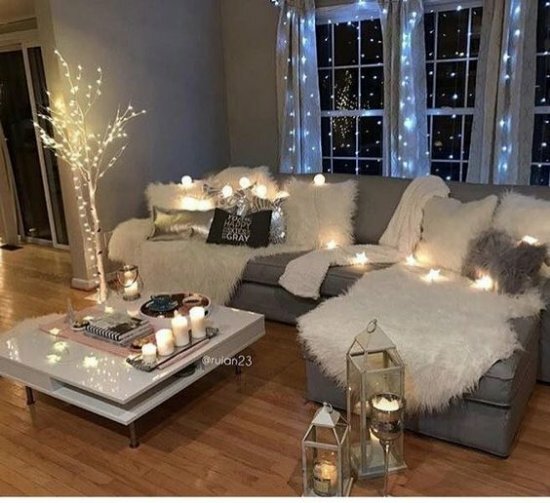 Add a bunch of cozy throws, shag rugs, cushions, warm socks, and hot chocolate to create a perfect atmosphere for relaxation and spending quality time with your loved ones. This is what Christmas is all about anyway! There we go – seven budget and property-friendly decoration ideas for Christmas. They will keep your wallet healthy and your inventory report in check !